Within the grounds of Croft Feach there is Culbokie Airfield a 500-meter landing strip, which has been designed for Microlight aircraft. The strip is grass and runs East-West, with secondary strip of 190m x 12m (grass runs E-W). The GPS navigational code is 57°35.13N – 004°19.07W. PPR essential..
Microlights are most welcome provided they have the necessary Insurance Cover. 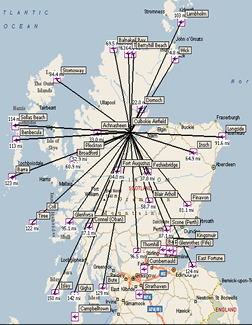 Pilots can fly on to Dornoch in the north, Inch in the east and Plockton in the west. An ideal base from where to fly to all corners of the Highlands and return to a warm welcome and good home cooked food.